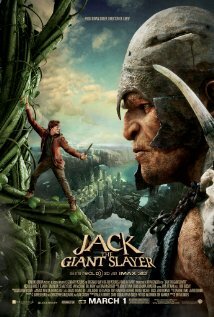 WARNING: This entry contains mild to significant spoilers for the movie, Jack the Giant Slayer. This review is dedicated to one of my Twitter followers, @ScribbleWorx, who is an artist that I’ve been talking to for a little while on that social media platform. He asked me about my thoughts on Jack the Giant Slayer, and I told him I hadn’t seen it, but for him I’d do so—after all, he’s working on a piece of artwork for me. If you’re interested in commissioning some artwork from him, reach out to him on Twitter. If you’re interested in seeing his work and perhaps purchasing some merchandise, please visit his storefront and Facebook page. Here’s the links to those: society6.com/scribbleworx | on.fb.me/SopxBb. After having seen this movie, I now think I have a better understanding of why this movie is getting mixed reviews as I personally had mixed feelings about it as well. I don’t think I can really say it’s a downright terrible movie, because it wasn’t. Does it fall short here and there? Yes, it does. In my opinion, I also think the story only really caters to a certain audience. Specifically I’m thinking about the people who enjoy TV shows like BBC’s Merlin. In fact, while they don’t look exactly the same, sometimes I found myself confusing Nicholas Hoult for Merlin‘s Colin Morgan. The casting for this movie was done well, and in fact, I was pleasantly surprised by Ewan McGregor and Stanley Tucci’s performances. It’s nice to see Tucci playing a more leading role, even if it is as a villain, and I was completely floored by McGregor. Some might argue I’m giving him too much credit, but it’s been so long since I’ve been impressed with his acting. He seemed like a completely different person here as Elmont, a character who I believe was a captain of the king’s royal guard, or something to that effect. Personally, I think he stole the show. In fact, I thought his acting was so wonderful that I actually wished he’d end up with the princess instead. I know, crazy, right? Not saying that Hoult’s Jack was bad because he wasn’t; I’d be lying if I said Jack wasn’t an endearing character. I’m assuming it was the way the character was written, but next to McGregor’s Elmont, Jack just wasn’t doing it for me. Of course, we all know from the get-go which two are supposed to end up together, but still I couldn’t help hoping the writers would give this fairytale a Snow White and the Huntsman (2012) sort of twist. I wouldn’t have minded in the slightest. I saw this movie in IMAX 3D, and visually speaking, I think I made the right choice. I have a feeling if I went to a regular 3D showing, the graphics wouldn’t have popped out as much as they did. Being completely honest, the story is a little cheesy and fairly predictable. How much I think people will enjoy it will probably boil down to how much a person enjoys the fantasy genre, and how much they mind watching a reinvention of a familiar childhood fairytale. Fans of BBC’s Merlin or those that enjoyed Snow White and the Huntsman will likely enjoy this film as well, as I was reminded strongly of both while I was watching. Towards the end, I started to get a little jumpy because things got a little too violent for my own liking. It’s not anything most people would have a problem with though—I know I’m one of the few in the world who possess a faint heart, haha. The giants were pretty disgusting, as I suppose they should be. There was one part though where it was a little too gross and I felt the urge to upchuck dinner, or at least part of it. As for what I didn’t think worked so well in this movie, they are quips I have where if they were addressed, then there wouldn’t have been much of a story to tell. I don’t know whether or not I’d consider what I write next to be spoilers, so if at this point you’re only curious as to what I’ve rated the film, then I’d scroll over the next bit. A majority of the issues I had with this movie revolved around the character of the princess. If the movie could be renamed, then its new title would be something like The One Where Everyone Cleans the Princess’ Royal Mess. A long title, yes, but I’d like to say it’s a pretty accurate one. There was a point where the princess laments that none of the terrible events in the story would have happened if she hadn’t made so many wrong decisions (though not those exact words) and I couldn’t help but laugh because even though Jack tells her it isn’t true, it so totally is. Of course, Jack also is to blame for the beanstalk sprouting in the first place, but I think it’s safe to say that at least 90% of the problems were all thanks to the princess. I was actually tottering between this or a B- rating for this film. Like I said, I had conflicting opinions of this movie after having watched it. What I can say is that I did not feel like I wasted money or the time on this. If anything, McGregor’s performance, I think, is enough to make this one worth considering. Ah give it a B you know you want to. I hated Snow White and the Huntsnan as it was all tech, mean spirited violence and terrible KS acting (any other kind?). This however has decent acting by Wean and Nicholas, a bed time story that brings in the family and parenting with memories of our childhood. Yes Isabelle says she has made mistakes; we all do its growing up. Take this at face value and don’t judge the book by its cover. Write on Rae. Hahaha, good to see you as always! 🙂 I will say though, while yes, we all make mistakes growing up, you have to admit the ones Isabelle makes in this movie are colossal. You might say Isabelle’s mistake are giant but stocks in Jack do pay off handsomely.